The Democrats are losing their minds. While Trump is trying to help America and the American people all they have been doing is trying to undermine everything the President does. During an appearance on MSNBC’s All In with Chris Hayes, California Congresswoman Maxine Waters spread a disgusting Fake News story about President Trump and Deutsche Bank. “They do not have the kind of operation in the bank that would keep up with what is going on and we can follow what is going on. But they have been known to basically get around the kind of controls that they should have,” Waters added. 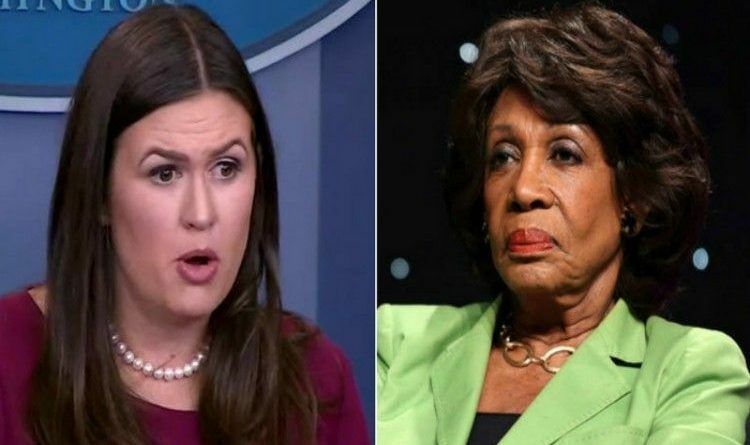 Unfortunately for Waters, White House Press secretary Sarah Sanders is not that kind of a woman who will stay silent on the matter. Sanders explained the issue when a reporter asked her a similar question. “Look, I think it’s important to note and hope you guys have seen this statement that Jay Sekulow, a member of the president’s legal team, has put out within the last hour,” said Sanders. “That they confirmed that the news reports that the special counsel had subpoenaed financial records relating to the president are completely false, no subpoena has been issued or received, we’ve confirmed this with the bank and other sources,” said Sanders. Thank you, Sarah, as usual, for setting the record straight. Sarah Huckabee Sanders is the best! She brings the truth to us and debunks lying stories like this. Maxine Waters is nothing but a big mouth liberal who rejoices at thinking something has come forward to hurt Trump. In fact, she doesn’t even try to confirm anything negative toward the President so she just makes a fool of herself by spreading lies. The funny part is, Trump, put the Deutsch Bank story out there to catch a leaker…the whole story was FALSE but it did catch the leaker and Maxine is the STUPIDASS that never checked the facts. Now let’s talk about Max’s husband’s bank that we bailed out! Her husband owned a great deal of stock in OneUnited Bank…she secured a bailout for the bank to protect all the stock, she was charged with ethics violations. She has also been selected as the most corrupt member of Congress for 6 or 7 years! And she has the NERVE to try to impeach Trump? What do you think? Scroll down to leave a comment below.